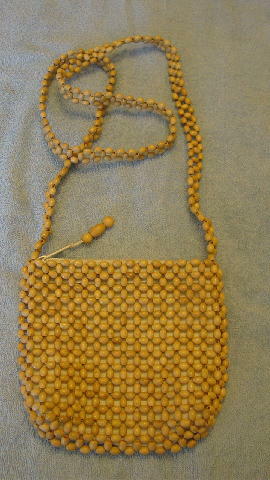 This sandy-tan beaded little purse is by Croft & Barrow (C & B Sport). It has a top side to side zipper closure with a 3 bead pull. There is a light bone color fabric lining which has Eden in black letters on the upper side of the interior open pocket. Eden put her name inside the purse when rooming with other models in Paris. 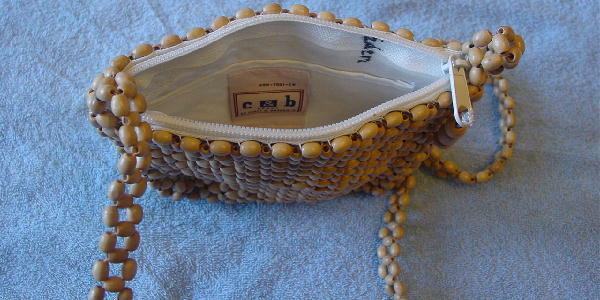 There is a 44 1/2" long by 5/8" wide beaded shoulder strap.